My mentor, the late, great Dr. Javier Ortiz Calderon, accepting my final paper to seal my graduation and telling me "Sigue pa' adelante" [Keep moving forward]. It prepared me for the diversity of the world. 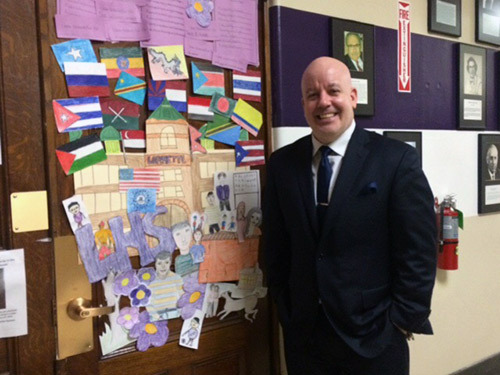 I became an ESL teacher, union leader and principal of International HS at LaGuardia Community College and Master Principal of Peace and Diversity and Bronx High School of Business in the NYCDOE. Now I am back in Buffalo at Lafayette International High School effective September 2016, partnering with Buffalo State! Biggest accomplishment by far, however, is being a dad to two amazing, bilingual daughters! Don't wait for tomorrow for what you can do today, giving back to the community can bring you a gratification that can make your life meaningful and beautiful, and be proud of being a Buffalo State grad!